Argentina, Uruguay and Paraguay will form a joint bid to host the centenary World Cup in 2030, the presidents of the three countries confirmed on Wednesday. Argentina, Uruguay and Paraguay formally launched South America's three-nation bid to host the 2030 World Cup on Wednesday and said Argentina would likely host the majority of the tournament's stadiums. Uruguay won the first World Cup in Montevideo after beating neighbor Argentina 4-2 in the final. Argentina and Uruguay, who have both won the World Cup twice, decided to launch a joint bid earlier this year and later added Paraguay, which has never won the tournament. A joint United States-Mexico-Canada bid is the favorite to host the 2026 tournament, with only one other country, Morocco, having entered the bidding race. 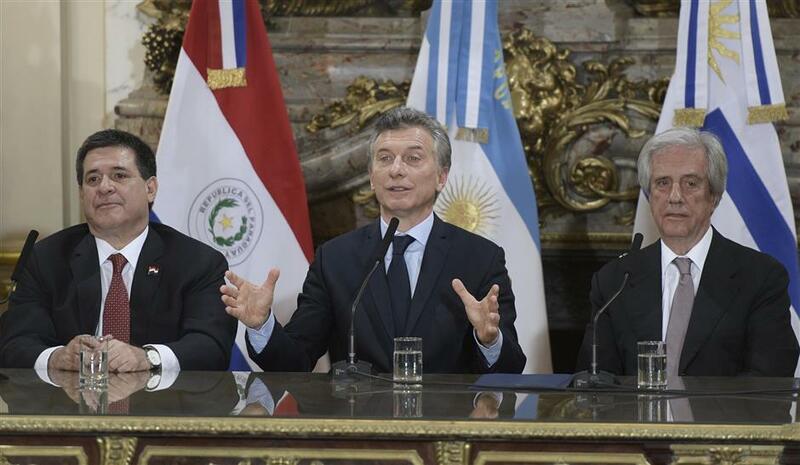 Argentina President Mauricio Macri (center) answers a journalist's question next to Uruguay President Tabare Vazquez (right) and Paraguay President Horacio Cartes after a meeting at Casa Rosada presidential house in Buenos Aires on October 4, 2017. Argentina, Paraguay and Uruguay formalized their candidacy to organize the FIFA World Cup 2030.